An instructive and entertaining look at Darwin’s “experimentising” and how it can be readily duplicated using mostly simple household tools. Costa (Biology/Western Carolina Univ. ; Wallace, Darwin, and the Origin of Species, 2014, etc. ), the executive director of the Highlands Biological Station, presents not just a how-to, but also a profile of Darwin in his time and place as he connected with other scientists and relied on them and on friends and family for assistance in his fieldwork. Darwin’s enormous curiosity about how nature works and how adaptations arise from natural selection led him to constantly examine his surroundings with a careful eye. Costa shows him investigating the anatomy of barnacles, honeycombs of bees, dispersion of seeds, reproduction techniques of orchids, behavior of carnivorous plants, twisting of vines, and earth-moving capacity of worms. Occasionally, Darwin called on other naturalists for help in gathering specimens, and he relied on the labor of his own children, who apparently were enthusiastic assistants. 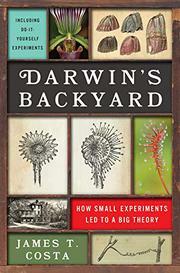 In each chapter, Costa describes a specific area of Darwin’s work and includes a materials list and a step-by-step procedure that demonstrates how to set up a related experiment, what to look for, and how to record one’s observations—in other words, how to think like a scientist. What makes this more than a textbook is the full portrait of Darwin that emerges. We see him as an inquisitive youngster; a beetle-collecting college student; a hardworking naturalist who endured seasickness and other obstacles during his years on the Beagle; a husband and family man, enduring the illnesses and deaths of three of his children; and always as a man consumed with curiosity about the natural world and finding many of the answers in his own backyard. While casual readers may not be tempted to perform the experiments, the insights Costa provides into Darwin’s thinking and his revelations about the great man’s working life make this a worthwhile read. A perfect resource for biology teachers.